As you probably know, I like converting manual input cells to formula cells in Excel. To me, the more I can delegate to Excel the better off I am. Some workbooks can benefit by automatically computing the last day of the month, eliminating one more manual input cell. As you also know, it seems that in Excel, there are many ways to accomplish any given task. Here, I’ll explore two methods for computing the last day of a given month. My favorite method is the EOMONTH function. 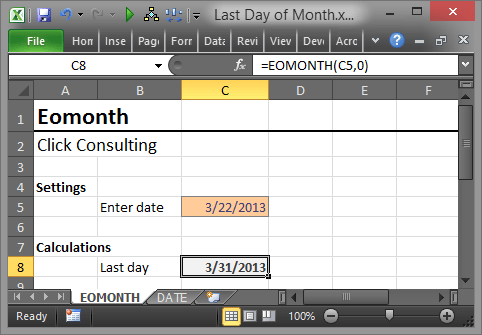 The EOMONTH function returns the end of the month (last day of the month) for any given date. There are two function arguments, the first argument is the starting date. The second argument is the number of months in the future to go, where 0 means the current month (the same month as the starting date). For accounting professionals that use date driven workbooks, being able to quickly determine the last day of any given month is pretty handy. When you use 0 for the day, it goes back one day, to the last day of the previous month. The following function returns the date of 7/1/2013. So, these are two pretty handy ways to determine the last day of the month. Here is a workbook Last Day of Month that uses these functions. Note: Depending on which version of Excel you have, you may need to activate the Analysis ToolPak before getting access to the EOMONTH function.